Although not a meal for dinner, great idea for breakfast or a snack. My mom came up with this recipe years ago when I was on a huge Jamba Juice kick. You do need a blender for this recipe. Blend the ice and the orange juice. Add the fruit and blend. 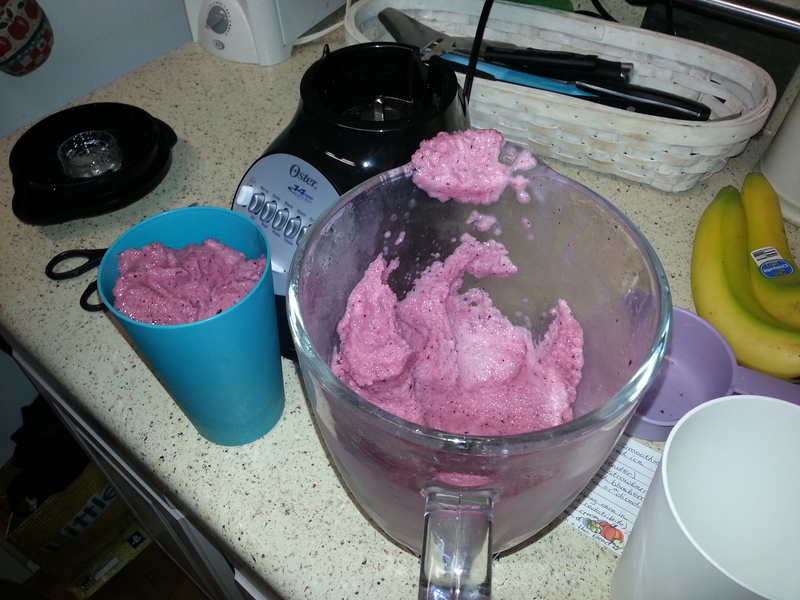 Add the ice cream and blend until you have a consistency you desire. Really easy, right? And you can easily switch out frozen fruit for fresh or use different kinds of fruit as well. Gene is thinking that next time, we can use half ice, half frozen pineapple juice to give it a more tangy flavor. I’d like to add some peaches to it someday too. And of course you can always use yogurt instead of ice cream, but I prefer the ice cream so that’s what I’m sticking with. It’s really not that much so I figure it all balances out! Makes two full glasses of smoothie, great for two people. Next Post What I like Wednesday: Tetris shelves!